What does the future hold for Stan, Kyle, Cartman, and poor Kenny? Has the South Park TV show been cancelled or renewed for a 22nd season on Comedy Central? The television vulture is watching for the latest cancellation and renewal news, so this page is the place to track the status of South Park season 22. Bookmark it, or subscribe for the latest updates. Remember, the television vulture is watching your shows. Are you? A Comedy Central animated adult comedy from Trey Parker and Matt Stone, South Park centers on the exploits of four third grade boys who live in South Park, Colorado: Stanley “Stan” Marsh (Parker), Kyle Broflovski (Stone), Kenneth “Kenny” McCormick (Stone), and Eric Cartman (Parker). The Comedy Central voice cast also includes: Mona Marshall, April Stewart, Adrien Beard, and Jennifer Howell. The 21 season of South Park averaged a 0.66 rating in the 18-49 demographic and 1.15 million viewers. Compared to season 20, that’s down by 36% and down by 34%, respectively. Find out how South Park stacks up against other scripted Comedy Central TV shows. 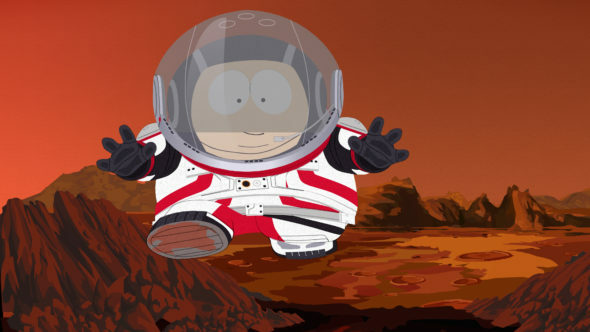 On July 8, 2015, South Park was renewed through its 23rd season. Season 22 debuts September 26, 2018. Stay tuned for further updates. You don’t have to spend your time wondering if South Park will be cancelled or renewed for season 22 on Comedy Central, since it was renewed through season 23, back in July of 2015, before season 19 even premiered. Still, even renewals can be cancelled, so I’ll keep an eye on the Nielsen ratings and update this page with any developments. Subscribe for free alerts on any South Park cancellation and renewal news. Find more South Park TV series news or other Comedy Central TV show news. What do you think? Are you happy the South Park TV is renewed through season 23? How would you feel, had Comedy Central cancelled this TV series, instead? I hope it gets put out of its misery, it’s sad it has to happen but there’s no way back. Switching to serialization was the equivalent of putting it on life support. Season 19 ended on an anticlimactic WTF note, season 20 went nowhere since it depended on Clinton winning the election, season 21 was just as lost, three strikes and it’s out. Young Justice and Max Steel get cancelled after 2 Seasons but this crap gets renewed into Season 23. You just don’t get it. Do you even watch it? LOOK. Last few seasons were ehhh to say the least, BUT after 18 or 19 killer ones it’s fine to have a few bad ones .. I’ll always give another round to the guys who came up with ROB SCHNIDER DERPP DE DERP. !. That **** destroyed us. f the hate and keep writing. Why not… the president is a duck.. WHO CARES?! I have been a south park fan since spirit of Christmas and ever since then every episode I have seen from then on was amazing if the creators keep going I will keep watching but if it is time to stop then that is comedy centrals decision not Matt or Treys my favorite episode is and will always be ill crime stoppers.